Chateau Labadie was classed as a Cru Bourgeois in the 1932 classification and again in the 2003 revision. 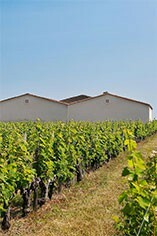 The wine estate lies at the northern tip of the Medoc, around the village of Begadan, and for many years the grapes were sold to the local co-operative. In 1988, however, owners Yves and Adelaide Bibey changed policy and decided to make their own wine. In 1999 their son, Jerome, joined them and he has gradually taken over the control of the estate. The soil is a combination of clay/limestone, highly suited to the Merlot grape, and gravel, on which Cabernet Sauvignon is planted. The estate owns 40 hectares of vines, producing 2400 hectolitres each year from 50% Cabernet Sauvignon, 45% Merlot and 5% Cabernet Franc. The wines are fermented in either stainless steel or cement tanks, and aged in oak barrels, a small percentage new, for 12-15 months prior to bottling.